This paper is about the intelligent decision-making system for the smart grid based electricity market which requires distributed decision making on the competitive environments composed of many players and components. It is very important to consider the renewable energy and emission problem which are expected to be monitored by wireless communication networks. It is very difficult to predict renewable energy outputs and emission prices over time horizon, so it could be helpful to catch up those data on real time basis using many different kinds of communication infrastructures. On this backgrounds this paper provides an algorithm to make an optimal decision considering above factors. Renewable generators have been increasing in generation sector driven by government driven policies and economic incentives to each utility. Renewable Portfolio Standard (RPS) is a good example of forced encouragement on introducing renewable energy sources by governments. RPS is a state policy mandating a state to generate a percent of its electricity from renewable source . On economic incentives, they are given to utilities by global environment regulations such as emission constraints and economic efficiency improvements on renewable generation facilities by technology developments. Generators are forced to introduce renewable energy replacing the conventional fossil fueled generators with renewable generators for mitigating emission constraints with reference to the Kyoto protocol. There are two ways to fulfill emission constraints. One is to purchase emission rights from those who pollute less or in trading markets. The other option is to produce the emission credits themselves through (Clean Development Mechanism CDM) business opportunities including the construction of renewable energy sources. Rapid progress in this technology has reduced costs until they are competitive with those of conventional power . Since they took a small capacity of generation in the beginning, there has been no serious consideration on impacts to the power system. As the portion of renewable energy shows a rapid increase recently, it is expected to have a big influence on system operation and business activities in the near future. Therefore it is required for utilities to build a management algorithm for dealing with decision-making problems composed of the changing variables such as renewable energy and emission trading. And the algorithm is run based on the information acquired from the communication network. This study deals with the idea of an intelligent decision-making system for the renewable issues under recent energy management system environments on the aspects of physical system and institutional scheme changes. The electric power system is largely composed of two kinds of infrastructures which are the electric power supply system and the information infrastructure to control the supply process. The communication networks of energy systems are being integrated into other communication networks and expanded to wide areas for the increasing requirements of intelligent automation and control while it is currently confined to the SCADA system that monitors and controls the power system. One of the big differences from the current SCADA system is to introduce the end customers into the interaction in the network, which is illustrated in Figure 1. Evolution from SCADA system to Smart Grid. As the SCADA system evolves it is expected to be connected to satellites, sensor networks, the Internet, and so forth, in near future. 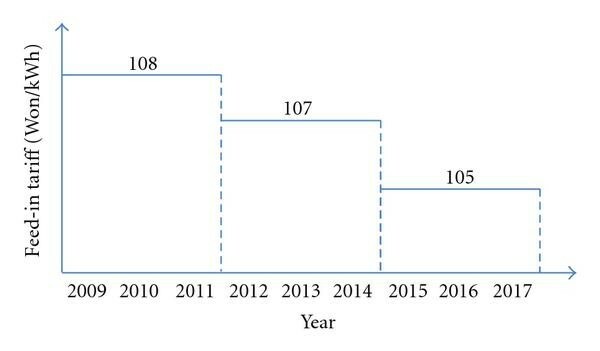 This trend comes to the vision of smart grid as shown in Figure 2 . Many new concepts and paradigms are introduced into the smart grid such as renewable generator operation, demand response, microgrid, sensor networks, and so forth. Renewable generators are not able to be centrally controlled as the way of the conventional fossil fueled generators. Demand response is a newly introducing concept for making the markets in electric power industry. Microgrid is an independent local power system with a small scale of generators including renewable energy sources. Sensor networks are installed for many purposes such as monitoring system status or faults, assessing renewable resources, and so forth. All these factors are difficult to be dealt with in central dispatch systems; therefore it is required to transfer from centrally controlled structure distributed control scheme. Smart grid vision [ 3 ]. It is considered five variables such as renewable energy production cost, potential renewable resource assessment, electricity market price, emission trading, and government policy like (feed-in tariff FIT) for the decision-making of utilities on the investment planning and operation scheduling of renewable energy sources. 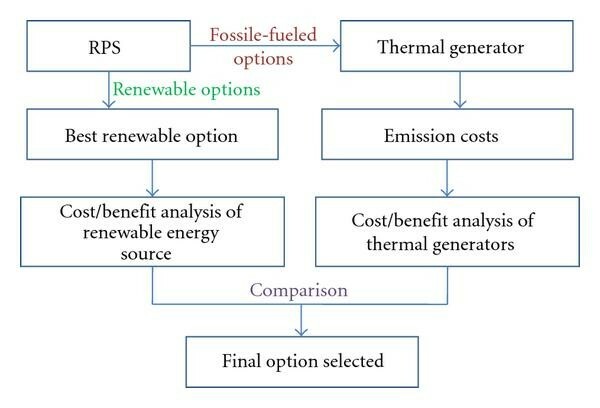 An example process of decision-making on renewable energy is illustrated in Figure 3 based on the variables stated above. Decision-making process on renewable energy. Decision-making is no longer a uniquely human function in complex systems. Indeed, the speed and complexity of many system processes often preclude the human from decision and control functions . Especially, the problems in electric power industry deal with lots of data and variables which comprises a huge scale of problem with thousands of variables so that it is inevitable to be supported by computerized tool on the decision-making process. Supporting decision-making requires understanding of both the processes involved and the provision of a computer-based system that supports these processes and allows them to be carried out more effectively . 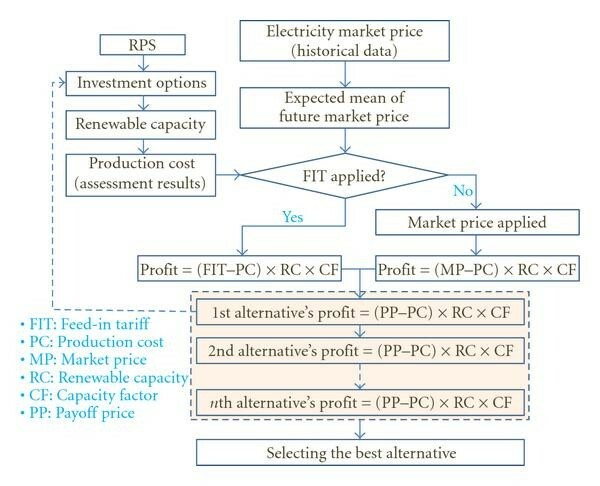 Renewable energy business also requires several decision-making processes shown in Figure 1 considering lots of strategic variables connected with electric power system as stated above. This study applies the intelligent decision-making process to the renewable energy business. 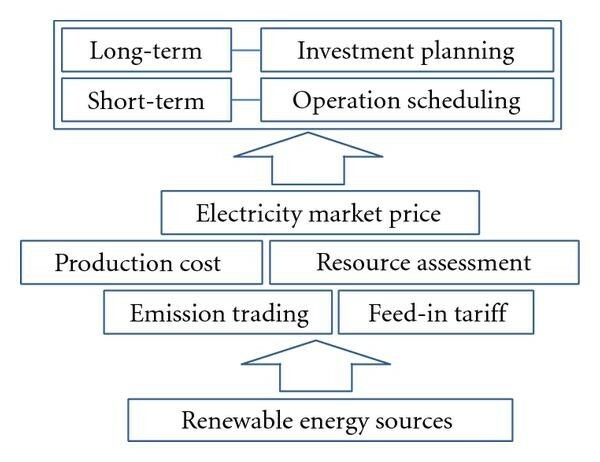 Renewable energy business has several external variables affecting the decision-making process as shown in Figure 3. In addition, renewable generators using wind power have more uncertainties than conventional fossil fueled generators on output characteristics. There are several critical variables which are critically considered in guiding decisions on which energy resources are appropriate for given conditions. The representative variables are energy and economic efficiencies, energy market price paid off for providing energy with renewable resources. Economic efficiency is about getting the benefit as much as possible from the same productive resources or the same benefit with the least cost while energy efficiency indicates a narrower concept of getting the greatest benefit from energy resources. In market environments resource allocation is guided by the signals of production costs and market prices. Renewable energy is mainly transformed into electricity; therefore the electricity market price is one of important factors affecting the production and allocation of renewable energy. On current situation the production cost of renewable energy is much more expensive than fossil fueled energy so it is very difficult to expect a fair competition between two different energy sources. For mitigating the difference on competitive capabilities originated from production costs, governments generally support the renewable energy sources with policy level measures such as RPS and RPS. RPS was already described above, and feed-in tariff is a pricing scheme to guarantee renewable capacity developers a minimum price and power system access rights to promote the development of renewable energy. Electricity market price is going to be the most critical factor affecting the profitability of renewable energy providers in near future while the excessive production cost above the market price is recovered by transient policy supports like FIT. Electricity price changes on real-time basis so it is necessarily required to introduce stochastic models to reflect the uncertainty of future prices. 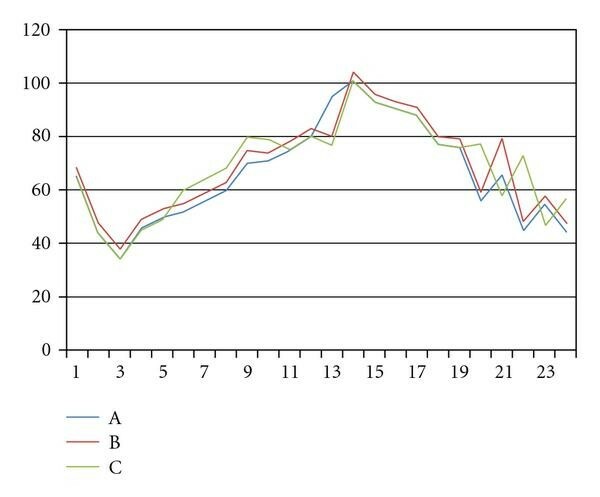 Figure 4 shows an example of simulation on electricity market prices of hourly basis. Examples of hourly market price trajectories. User interface example of market simulator. These market prices could be forecasted by market simulators provided by commercial vendors. There are several popular ones like GE's MAPS, Henwood's PROSYM, Drayton Analytics' PLEXOS, CRA's CeMOS, and so forth. 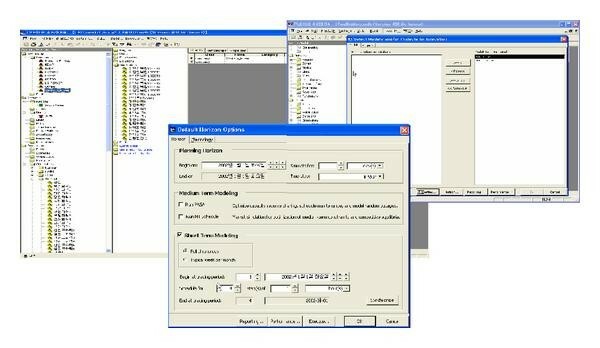 Academic and noncommercial versions have been made for research purposes using general computerized tools like MATLAB or GAMS which are also used for making commercial tools. Production cost is another critical factor with market price for determining the profit of renewable energy producers. 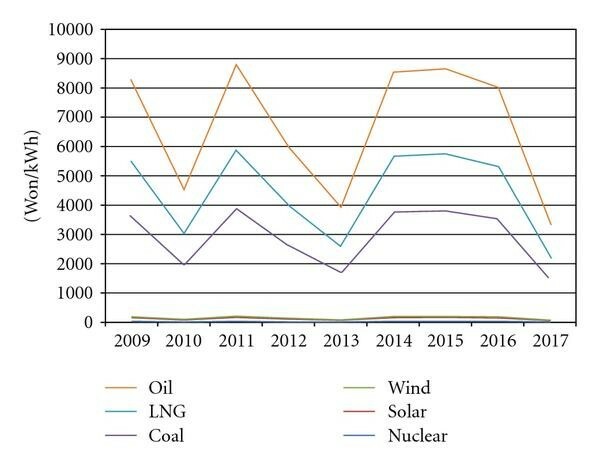 The production cost of renewable energy is much higher than fossil fuel, but the gap is being fast narrowed as the renewable technology advances, and the environmental costs are added to fossil fueled generators. So it is very important to assess the exact production cost reflecting related polices and environmental cost components like emission costs. It is a main difficulty in developing renewable energy sources to assess the exact resource quantity of renewable energy. For example, wind energy is very variable according to time and site which also increases the difficulties on operation and the uncertainties in business. The resource assessment results become a basis for determining whether to build wind capacity or not because the resource quantity directly affects the energy and economic efficiency at the same time. Since the Kyoto protocol in effect, the emission constraint has been another cost component to electric power generating companies. Therefore the companies should make their investment plan on generation capacity considering emissions because the emission cost increases the production costs of fossil fueled generating units. There are two options for generation companies to fulfill emission constraints. One is to build renewable energy facilities or work on CDM projects, which is usually long-term based. The other option is to buy emission credits from the emission trading markets, which is available on short-term basis when emission obligations are given at the year. Emission credits also traded in the market with the variable market price. 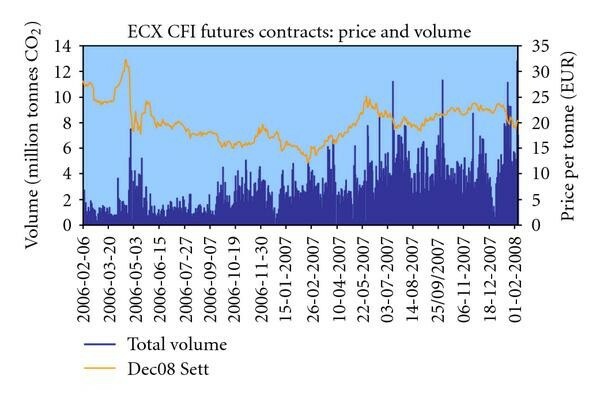 Figure 6 shows the changing volumes and prices of (Carbon Financial Instrument CFI) futures contracts in the (European Climate Exchange ECX) market over the time horizon. Feed-in tariffs (FITs) aim to support the market development of renewable energy technologies, specifically for electricity generation. 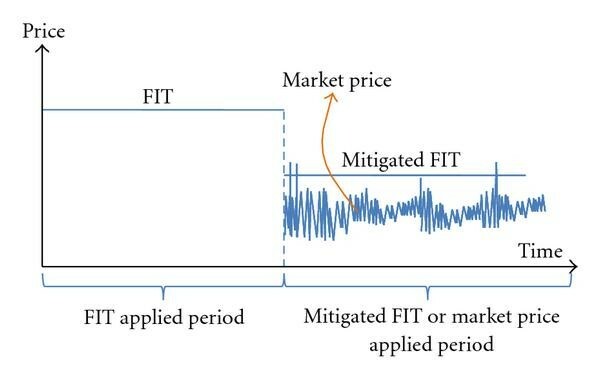 FITs put a legal obligation on utilities and energy companies to purchase electricity from renewable energy producers at a favorable price per unit, and this price is usually guaranteed over a certain period of time . Therefore it is required to consider the cost-benefit analysis and assess the related risks because FITs do not last beyond that period. The application period and price level depend on the government policies which are very uncertain variables. It is required to define the strategic variables for modeling any decision-making tool and specify the data used for finding out the solution. Strategic variables are defined in the mathematical formulation and the operation data acquired from communication channels as input data. Renewable energy business has several strategic variables for generation companies to maximize the profit and minimize the risk considering the external variables. According to current electricity market rules, renewable generators are not centrally dispatched as nuclear and fossil fueled generators so it is assumed that there is no strategic variable on operation mode. Considering investment problems there are several strategic variables such as the kinds of renewable energies (solar, wind, geothermal, etc. ), the capacity of energy source, the investment time, and so forth. For simplification these variables are integrated into an alternative function like (k, c, t). So it is considered as the decision-making problem to decide which one is the best option among given alternatives. Figure 8 is an example of concept design on the intelligent decision-making system for renewable energy investments. 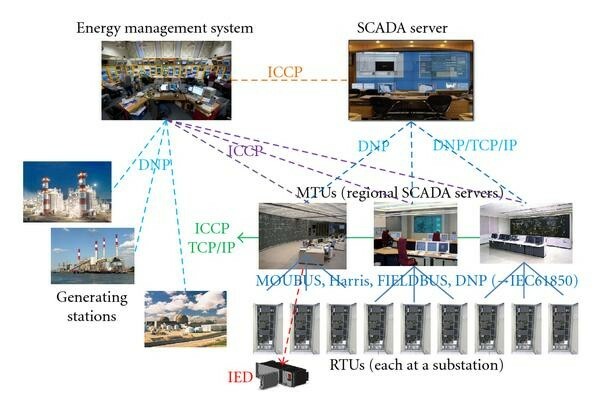 (Supervisory Control and Data Acquisition SCADA) is a system operation with coded signals over communication channels so as to provide control of (Remote Terminal Unit RTU) equipment . Recently Intelligent Electronic Device (IED) which is control unit having communication function with master station is replacing the role of RTU. SCADA system has been used for remote measurement and control on the critical infrastructures such as electric power, gas, and oil as well as modern industrial facilities such as chemical factories, manufacturing facilities . 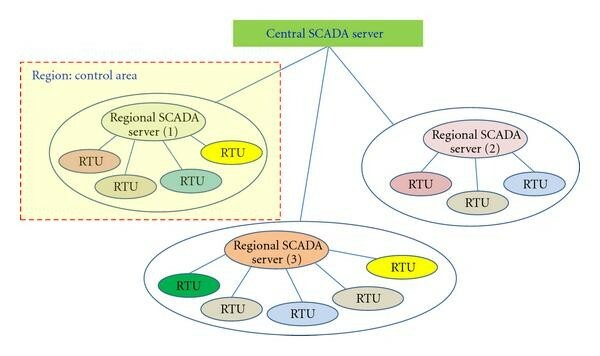 SCADA system is largely composed of three parts of SCADA server, (Remote Terminal Units RTUs), communication links connecting two terminal parts as shown in Figure 9. Communication links consist of several kinds of channels on the aspect of physical media, protocols, topologies, and so forth. Or all those channels are mixed or interconnected. Originally SCADA network was a private network exclusive to other networks or the Internet, but it is getting integrated into the Internet for more advanced control functions and economic efficiencies. Operation data are collected from the (Supervisory Control and Data Acquisition SCADA) system also for renewable energy sources. Wind power is the representative one among renewable energy sources. 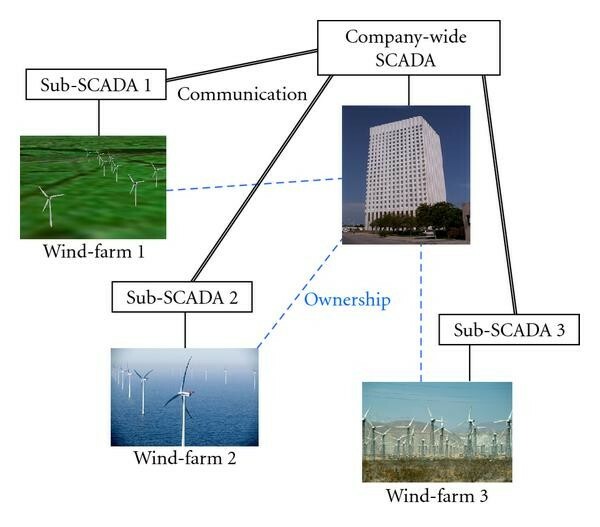 Assuming the wind power, the company-wide SCADA system consists of several sub-SCADA system monitoring wind farms locally distributed over wide areas as shown in Figure 10. Operation data acquired from SCADA system are used for the resource assessments and operational characteristics which are references for future investment decisions on new renewable facilities. Renewable generators are dispersed over wide area, so various channels are used for the communication. 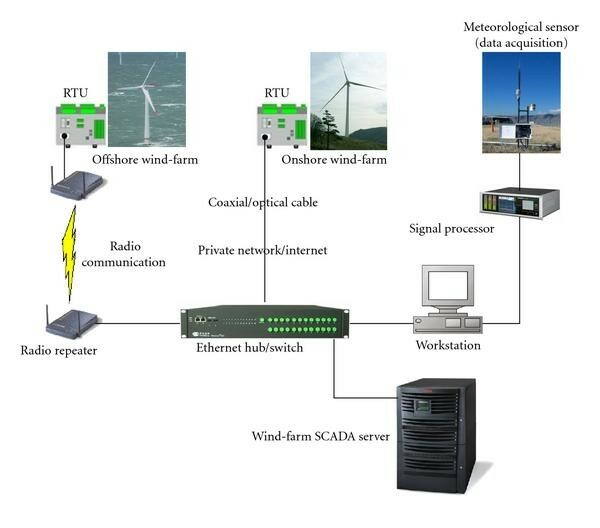 Onshore wind farms are usually connected with wire communication methods using coaxial or optical cables, while offshore wind farms communicate with the SCADA server on radio channels. The data acquired from remote wind farms are used for intelligent decision-making system in Figure 8 and also reviewed to analyze if the decisions made by the system are appropriate. If the decision does not match the operation data then the decision would be corrected for the next period. 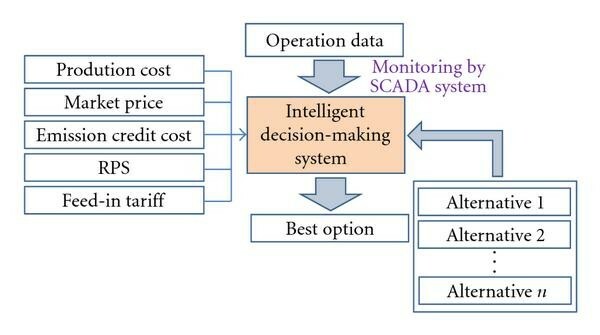 Figure 12 shows the interaction process between Intelligent Decision-making System (IDMS) and Wind farm SCADA system. Interaction between IDMS and SCADA system. It is required to make a mathematical formulation for modeling of intelligent decision-making system as a program-based tool. Optimization models are generally used for solving decision-making problems under given resources and conditions. The optimization model is generally composed of an objective function and multiple constraints. In this kind of business related model it is commonly used to maximize the profitability of the company for the objective function. Considering the profit maximization, the objective function of renewable energy business described in Figures 3 and 8 could be formulated as follows. An example is illustrated in Figure 14, which is about the decision-making algorithm for choosing the best option among candidate alternatives based on the optimization model in Figure 13 to maximize the profitability under given conditions. 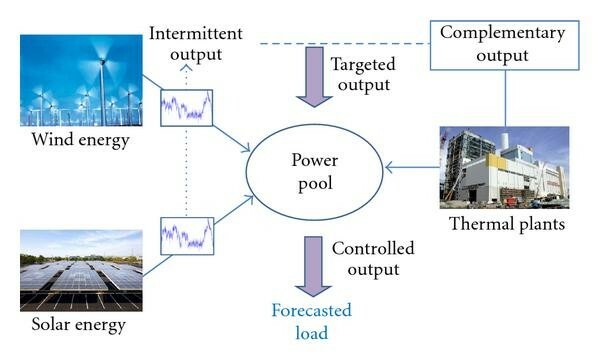 Decision-making algorithm for renewable capacity. 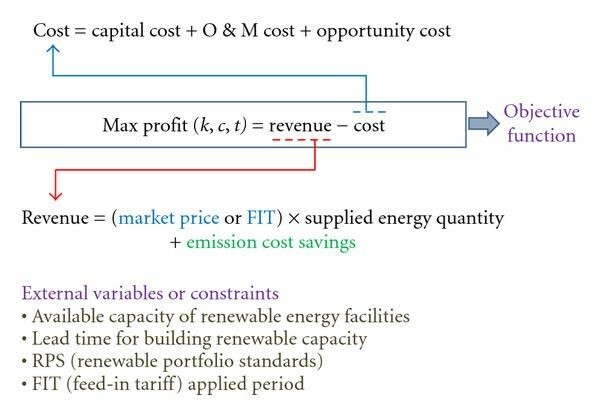 Once the best renewable option selected it is compared with the fossil fueled generator option on the aspect of cost/benefit analysis as shown in Figure 15. The one giving more benefit is selected as the final option. Selection between renewable and fossil fuel. Interaction between long-term and short-term Problems. Periodic market data acquisition from EPSIS. This decision-making algorithm could be modeled with lots of numerical and heuristic methods. And it could be reinforced with other mathematical model like game theory and (artificial intelligence AI) based approaches. Traditionally, simulation of business process is used to support strategic decision-making. In this case, simulation is used as a tool to analyze long-term effects of certain decisions. Simulation is rarely used for management control and operation control, because building a simulation model takes too much time to evaluate short effects . However the short-term operation and constraints are critical also on long-term strategic decision-making problems in the electric power system because the electricity market should be operated on the physical system. Therefore it is required to consider long-term and short-term problems as the components interacting with each other in a problem. In this section it is exampled that long-term and short-term problems are related to renewable energy sources in electricity market. Economic aspects of renewable source investments are dealt with in the first long-term problem section, and operational issues of renewable generator like coordinated dispatch with other thermal plants in the second short-term problem section. Electricity market prices are published by (Korea Power Exchange KPX) on its webpage, and those historical data used for forecasting future market prices. These data could be retrieved from (Electric Power Statistics Information System EPSIS) periodically as input data for IDMS. There are lots of methods and tools for forecasting the electricity market prices. The most simple and popular ones are statistics based function provided by spreadsheet programs, which mostly uses historical data. As more specialized tools, there are several computerized tools for electricity market simulation provided by commercial vendors. 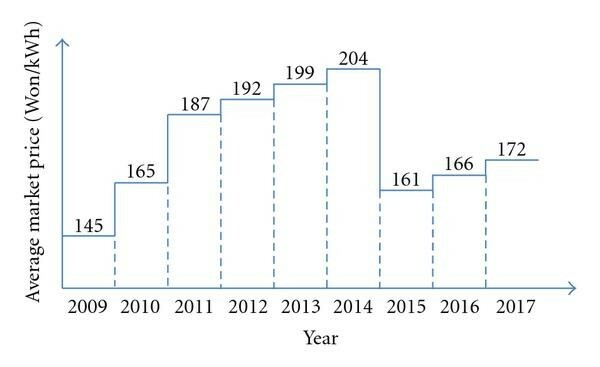 Figure 18 shows the electricity market prices recently published by KPX (Korea Power Exchange) for one month of March in 2009 . The average price for the month is 145[Won/kWh]. 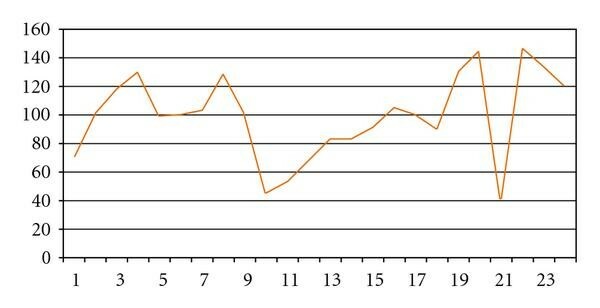 One month is not a long-term in electricity market and it shows any increasing or decreasing trend in Figure 18. The average price could be used for future investment plan by reflecting the load growth and the inflation rate as a simple scenario that there is no change on fuel costs and fuel mix ratio. When there is capacity investment or fuel cost variation, the long term market prices could go down as well as up. 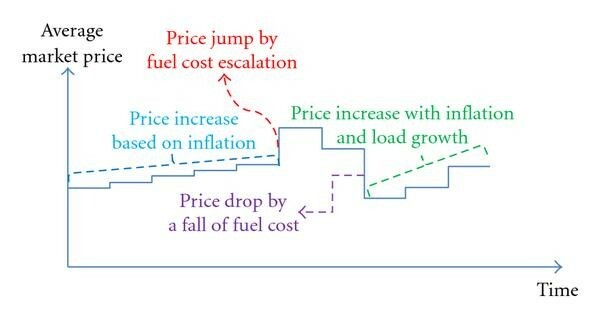 A scenario about the market price is assumed as shown in Figure 18 for the case study based on the concepts given in Figures 18 and 19. The product costs of wind power energy are variable dependent on the wind resource quantity and the load factors of the wind generators, so it is quite difficult to quantify the unit cost per unit energy (kWh). However it is required to do economic assessments. 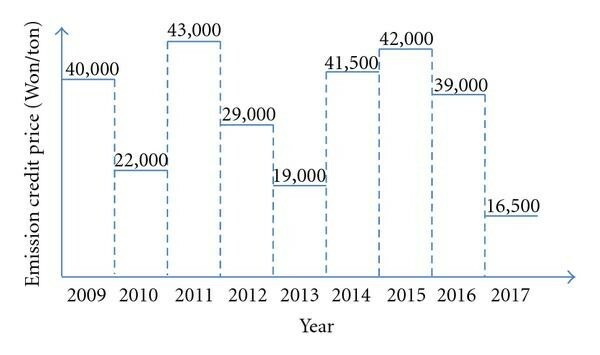 Production costs are applied like in Figures 21 and 22 in this case study, which are similar with the current cost levels of renewable energy production in Korea. As the technology advances the unit cost of renewable energy production is expected to decrease year by year. Figure 23 shows the generation costs of conventional thermal generators. Expected production costs of wind energy. Expected production costs of solar energy. Generation costs of conventional thermal generators. Feed-in tariffs are temporal measures for supporting the introduction of renewable energy sources until they have the economic competitiveness compared to conventional fossil fueled generators. The purchasing prices are applied to wind and solar energy resources in feed-in tariffs at the level of Figures 24 and 25. The price for wind is discounted 2% every 3 years and solar for 4%. 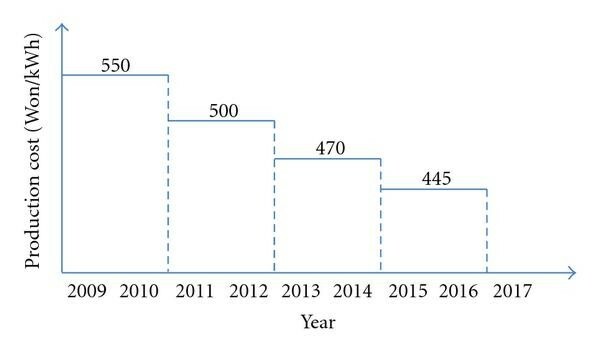 Feed-in tariffs applied to wind energy. Feed-in tariffs applied to solar energy. Feed-in tariffs are uncertain variables determined by government policies because policy-related variables are very hard to forecast. Therefore it is required to build various scenarios on feed-in tariffs to minimize the risks by applying the wrong payoff price to the profitability estimation of renewable energy sources. Emission costs are changing on real-time basis correlated with the price of emission credits according to the balancing condition between supply and demand in emission trading markets. The annually averaged prices are used for this case study for simplification. And the prices are multiplied by a multiplier (0.02) reflecting the transient status of emission costs applied to generation costs. The emission quantity[g] from each energy source per unit electricity [kWh] production is illustrated in Figure 25. Through the emission credit price [Won/ton] in Figure 26 and the emission quantity [g/kWh] in Figure 27, the emission cost can be recalculated as the unit [Won/kWh] in Figure 28. 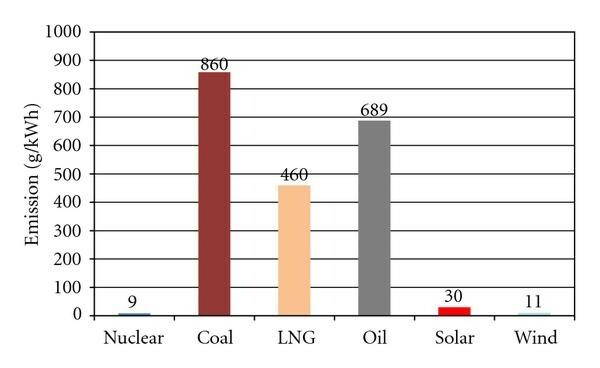 Emission quantities from different energy sources. Emission costs on energy sources. Considering all the data till now decision-making system based on the algorithm in Figures 14 and 15 gives the profitability result of each generation source over time horizon. This result is based on the assumption given in the beginning, so the result could be different by another assumption. 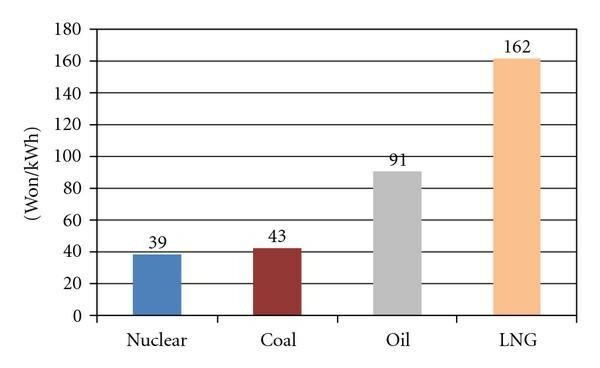 However it is expected to be similar to the trend in which nuclear and renewable energy sources have good profitability. 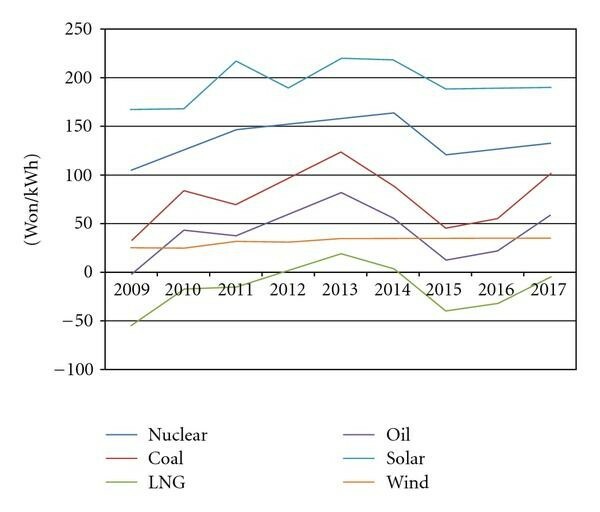 Nuclear, solar energy and wind energy show good profitability compared to other energy resources in Figure 29 and that trend will be stronger as the emission cost loads are heavier by increasing the multiplier to the value more than 0.02. Through the automation of this decision-making process, energy companies are expected to assess multiple alternatives on renewable investment plans. Profitability on each energy resource. Renewable energy sources as wind power and photovoltaics are intermittent in production and therefore not always available in the power supply, when needed. This of course can imply that conventional power capacity is to be available to compensate for the missing production from renewable plants . It is necessary to coordinate the renewable energy operation with other thermal plants both on economic aspects and system aspects because thermal plants have the most flexible ramp rate compared to other energy sources. This has also been studied in hydrothermal coordination for a long time. Traditionally, hydrothermal coordination is formulated as a cost minimization problem, that is, to minimize the total system cost (usually, the thermal production cost) . Renewable energy sources have intermittent supply characteristics more difficult to control compared to hydroenergy sources. As technology evolves renewable energy sources have been being more controllable. But it is not yet enough, so they are also required to be supported by thermal plants. 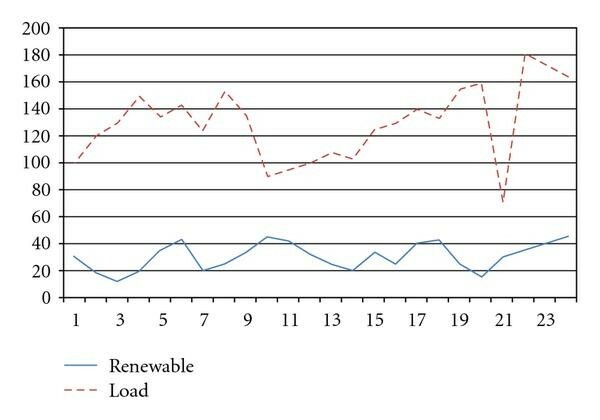 It is assumed that load data and renewable outputs are forecasted as in Figure 30. Load data is forecasted by a module in (Energy Management System EMS) of KPX and published at the homepage. Historical data acquired from SCADA system are used for load forecast. SCADA system retrieves data from the RTU installed in each substation. 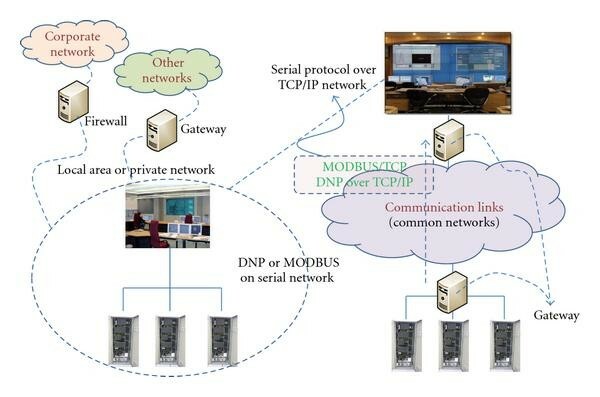 SCADA system and EMS are also connected with each other's data exchange based on the (InterControl Center Communication Protocol ICCP). Considering the forecasted load and expected renewable outputs, EMS issues the dispatch order to thermal generators to meet the net load subtracted by the renewable output from the originally forecasted load. 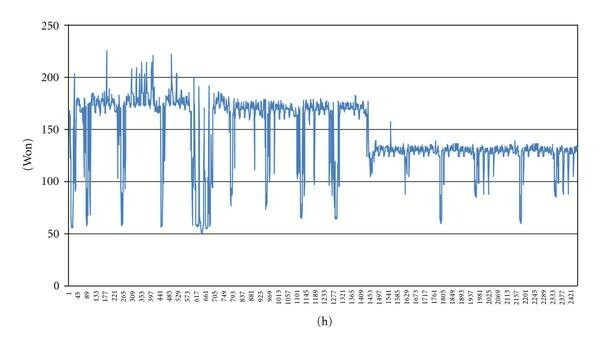 In the case of Figure 31 the net load is calculated as shown in Figure 33. Forecasted load and renewable output. Data exchange between SCADA and EMS. Net load offset between load and renewable output. Data exchange for coordination on wireless networks. The net load is supplied by thermal generators considering the uncertainties and up/down ramp rates of thermal generators. There are two uncertain variables on this process. One is forecasting errors in load forecast, and the other is in renewable output. Therefore it is required for system operator or generation companies to be updated with real-time information and thereby follow the net load variation. 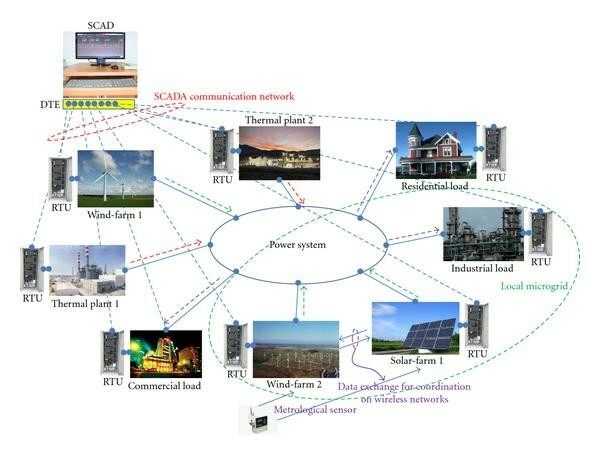 The information is mainly collected from SCADA system, but it is recommended to acquire from many other metrological sensor devices for predicting renewable resources. Wireless sensor networks seem very appropriate for this purpose on the aspect of power supply. Energy conservation plays a crucial role in wireless sensor networks since such networks are designed to be placed in hostile and nonaccessible areas. While battery-driven sensors will run out of battery sooner or later, the use of renewable energy sources such as solar or gravitation may extend the lifetime of a sensor . Interaction and coordination between generators could mitigate the uncertainties caused by intermittent property of renewable energy sources based on information acquired periodically from the existing SCADA system and wireless networks. The data collected from various network routes are analyzed and used for IDMS for optimal decision-making on short-term operational problems. Renewable generators are increasing in electric power industry with many incentives on green technologies and environmental regulations. This process is globally driven by governments, which causes many uncertainties on the aspects of physical system operation and electricity market business activities. In addition, electricity markets are interconnected with other business area like emission trading markets, and thereby the system is getting complicated as time goes on. Furthermore the system is required to be operated on real-time basis, so it is almost impossible for humans to make a decision on the huge scale of problem at every moment. This paper tries to propose a concept of an intelligent decision-making system to solve that kind of problem with renewable investment and operational issues instead of humans. For that purpose it is needed to have its own intelligent decision-making algorithm independent of humans. The last section introduced the application concept and example of IDMS to the long-term decision-making problem related to investment issues and short-term one about operational issues, respectively. It is expected to deal with more detail algorithms for modeling IDMS such as game theory, genetic algorithm, and so forth. The IDMS could be helped by distributed sensor networks for collecting information and monitoring the recent status on the aspect of physical system infrastructures. And the battery problem for the sensor networks is solved by renewable energy sources dispersed over wide areas, which comes to the concept of green pervasive computing.